Go short on a break below the support line. Go long on a break above the resistance line. Double tops are identified by two peaks of similar height, followed by a break below the level of the intervening trough. They are treacherous to trade, partly because of their similarity to triple tops and trading ranges. 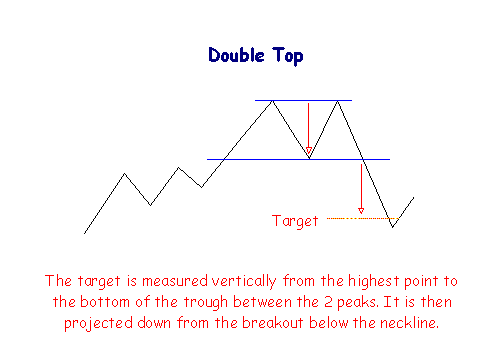 The target for a breakout move is measured vertically from the highest peak to the support line drawn through the intervening trough. This is then projected downwards from the breakout point. Reduced volume on the second peak followed by increased volume on the break below the support line. Price often rallies back to the support line which then acts as a resistance level. Go short on a reversal signal and place a stop-loss just above the resistance level. 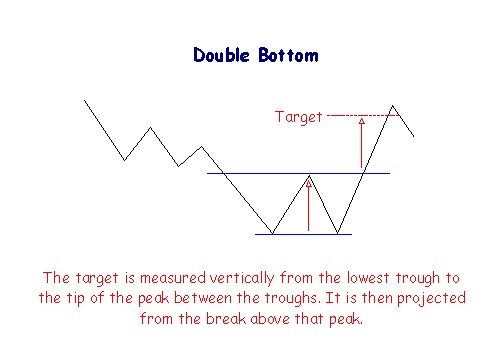 Double bottoms are also treacherous to trade, in part because of the similarity to triple bottoms and trading ranges. 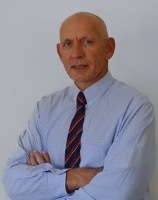 The target is measured from the lowest trough to the level of the intervening peak. It is then projected up from the break out above the resistance line. Reduced volume on the second trough followed by increased volume on the break above the resistance line. Place a stop-loss just below the last trough. Price often corrects back to the resistance line which then acts as a support level. Go long on a reversal signal and place a stop-loss just below the support level. Head & Shoulders A powerful reversal signal, the head and shoulders pattern is completed by a lower peak followed by a break below the neckline.